Is the "Childhood" Warsman in scale to the adult-sized figures, in other words, small? Edited by kayfabe1985, 29 April 2018 - 10:48 PM. This version of the Sofubi is the most economical (the color/painted version is more expensive); really cool looking piece. Edited by kayfabe1985, 29 April 2018 - 10:47 PM. The solid Flesh NSC Reborn line of Sofubi is extremely affordable and they are huge/tall but with thinner proportions. The only problem I have with this Sofubi is getting it to stand! Terryman has heels on his boots/sole of the feet and he wobbles (hence the doll stander). Edited by kayfabe1985, 05 May 2018 - 07:05 AM. Like the Terryman Sofubi, the only problem I have is getting it to stand! Warsman has heels on his boots/sole of the feet and he wobbles (hence the doll stander). Edited by kayfabe1985, 05 May 2018 - 07:04 AM. This was an impulse purchase, I saw it in a sales bin box at the Mandarake Shibuya branch. Not a big fan of the realistic "jacked up" versions/releases of the Kinnikuman characters but...I have been tempted to get the current Kagami Attitude release of Kinnikuman with the classic Ultraman pose from his first appearance. This line is very affordable and displays well with all the CCP figures & S.H. Figurarts figures. I'm surprised to learn that the skinnier, more doll-like Sofubi were made by Five Star. They look different enough from Five Star's chunkier figures that I thought they were made by a different company. Are the skinnier figures older? What's that Terryman on the front right? A statue? The Medicom/Five Star Reborn Sofubi are a couple of years old (two or three at the most); they release painted versions of those type of Sofubi as well (as recently as last year). Wow, Mike is amazing. I like how he made the figure look quite a bit like the Romando toy. And I'm so confused by the Sofubi and when they came out. Some just look more primitive to me, but I guess "retro" would be a better description. *Sigh* And I did buy Atlantis a couple of friends/opponents. I added a second Robin Mask to my collection recently- lime green! That Robin has a great sculpt. I love CCP, I picked these up at Superfest recently. Those ccp figures look great, but I can’t get into them because they’re static statues, which is weird because Keshi are basically are too, but I guess it’s the size. That being said Kinnikuman Zebra has always been a favorite. I’m waiting for fivestar to produce him eventually, and I want to see a tiger version done as well as a battlecat version. Do you know of any online store where you can pre-order upcoming Five Star Kinnikuman figures (before the price jumps up)? Battlecat Kinnikuman Zebra would be awesome! Edited by DetectiveFork, 06 May 2018 - 09:51 AM. I didn't know you could buy directly from Five Star, cool. Can you share their site? Is there a way to buy from yahoojapan without using a third party site like Jauce? Edited by DetectiveFork, 06 May 2018 - 07:37 PM. So after saying I would only buy one or two Sofubi, I found some good deals on figures I like and now own two with two more on the way. Just got this Robin Mask. The fully painted version of this figure is beautiful but rare and WAY out of my price range. 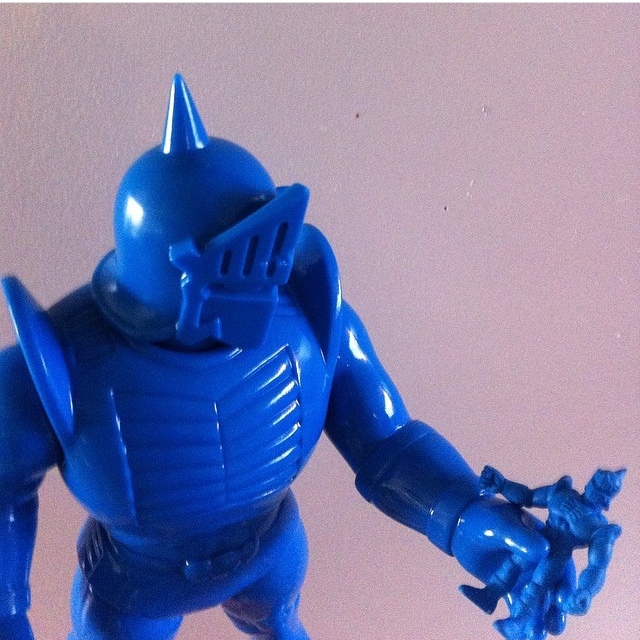 But this plain blue version was affordable and still shows off the dynamic sculpt. Big spending on those two sofubi! They look awesome, especially Nemesis as a newer character he is not oversaturated yet in terms of releases. Isn't this Meat figure adorable?? Not only is he a tiny Sofubi, he's flocked! !